What are her stories about? The first half of the book is filled with her almost auto biographical snatches of the general situation in a war-torn region. In 2012, most Lankans would have been fed up hearing sordid stories of war experiences because daily experiences were commonplace incidents that the people would have been immune from emotionally enraptured. However for others living in other parts of the world would find in these creative stories almost a documentary evidence of what the people had to undergo. The second part of the book deals with other experiences in the life of the writer in foreign climes. I found these stories quaint as they brought information that I might not have heard before. These experiences though related to the war and the people that escaped and domiciled in the west, they are fresh and treated differently in her stories. Right throughout the writer maintains a sense of balance and objectivity and her restraint exhibits certain maturity in understanding the human psyche. I do not wish to analyze each of the stories giving the theme, plot, characterization and the like because the readers must first read these stories. One of the front rank innovative short story writers with a remarkable writing style in Tamil, Uma Varatharajan from Kalmunai, has written a foreword for this book that perceptively analyses Chandra Ravindran’s stories. The book is published by Kalachuvadu Publications Pvt.Ltd, 669, K.P.Road, Nagarcoil 629 001, India. 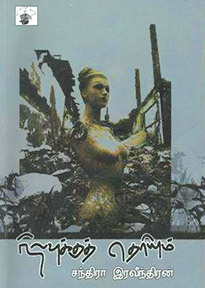 Readers inn Tamil fill find it of literary value as well. Someone should translate at least one of he stories into English for others to read.